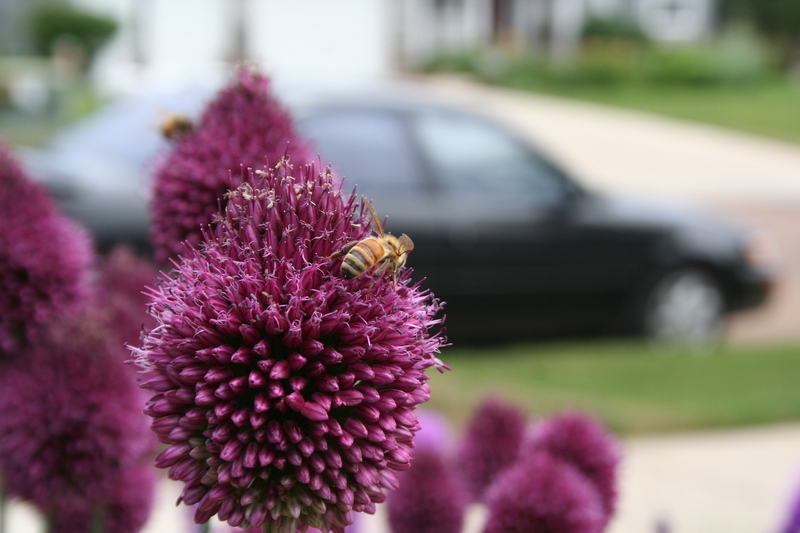 This allium is one of many that attract bees and other pollinators. I like to plant flowers that attract wildlife to the yard: bees, birds, butterflies. Seeing butterflies dance on top of a coneflower or watching a bird as it works diligently to remove a seed from a dried sunflower increases my appreciation for nature and — not to sound too sappy — life itself. So, discovering a plant that attracts wildlife far beyond expectations is a great pleasure. That’s been my reaction to this ornamental onion (Allium spaerocephalon) that I planted last fall. I’ve got clumps of it in three areas of the front yard, and not only is it a particularly handsome plant, but it’s a positive bee magnet. This bulb comes up in early to midsumer, long after tulips and daffodils are done. The tight flowerheads are shaped like an elongated sphere. They start out a bright green, but as the flowers open and spread, the color goes purple. Once it’s fully open, watch out — here come the bees! Yesterday, I found no fewer than a dozen bees buzzing around, gathering nectar from one of the clumps. Chives, another member of the allium family, is often suggested for attracting pollinators, but this allium seems to pull in many more bees than the chives I have. (Besides, chives are pretty invasive.) Allium spaerocephalon is recommended for rock gardens, borders, woodlands and the area between trees and shrubs. It makes a pretty cut flower, too, but why deprive the bees? All the allium in my gardens are prolific self-seeders (not only chives)! That said, I credit them with keeping deer from eating the lilies & daylilies. As long as deer noses find the allium before they walk into the garden, they’ll find other places to browse. Thanks for your comment, Annie. This is my first year with these other alliums (chives I have!) so I’ll be watching for the seedlings next year. We don’t have a big problem with deer in my yard–at least, not yet!